On June 6, 2003 I sent a letter to the members of the board of directors of Wyatt Archaeological Research (WAR). In that letter I expressed my concern over their recent plans to perform an excavation into the tunnel that leads from Zedekiah’s Cave to the cave chamber where the Ark of the Covenant is located. In my letter I included some of my reasons for my concerns and warned them that in my opinion, this is not God’s will and that they are taking a foolish risk. I asked them to reconsider their decision. To view a copy of the letter click here. For the record I want to state that I consider this to be a time of crisis in the movement to research and present the discoveries of Ron Wyatt to the world. Since Ron’s death in 1999 things have generally gone well with a number of groups moving the work forward. The work of Jonathan Gray and Dr. Lennart Moller immediately come to mind as well as many others who are assisting in the work. During these 4 years hundreds of thousands have been introduced to the Discoveries for the first time. During this same period little has been offered from WAR. It has been difficult to watch the situation as I was once very close to the people at WAR. It was my hope after Ron’s death that this organization would step forward and continue the work of its founder. Unfortunately that has not happened. Now it seems they are putting everything at risk with this latest plan which I fear is not according to God’s will. Let me say at the outset that I do not have any concern whatsoever that WAR’s actions or the actions of any human being will cause damage to God’s plan for how He intends to use this specific discovery. But I am concerned that by their unwise course they could put themselves and those that follow them into physical and spiritual danger. For this reason my advice to anyone considering being a part of WAR’s plan is have no part in it. Give it a wide berth. I will now share some of the background and information that is the basis for my concerns. Let each man or woman make their own decision. Early in 1997 the idea of a “Wyatt web site” was put forward by a new internet friend of mine, Rose Bowen. She and her husband were already aware of Ron’s discoveries from meetings he held in Roanoke, VA some time before. When they found out that I knew Ron personally and that he was actively sharing his material with me, Rose suggested that we archive Ron’s newsletters on the internet so that people could have access to them online. Over the next few months we worked out the details and the Anchor Stone Web Site was born. During those early months I talked at length with Ron and his wife about other material we could put on the site. In the course of those conversations we set up a page that is still on our current web site which has never been altered once it was posted. It is the “Questions” page, a sort of FAQ on the Ark of the Covenant. After I wrote the page I remember that Ron specifically had me edit some things on it at least once. In the final draft (which is the current one) there is a question about the current status of the Ark of the Covenant dig. The answer given there, which was confirmed by Ron, is that the current status of the dig is that it is finished; that the next thing to take place was for the tables of stone to be brought out. The answer was a short one and that was the way Ron wanted it. But there is more behind the answer than most people know. In my visits with Ron at his home we talked about many things. I would ask Ron questions about the discoveries but was always careful around certain sensitive subjects. One of those was, of course, the Ark of the Covenant. I found that Ron would rarely give me information about this subject that wasn’t already publicly known. So I stopped asking him about it. Many times when we visited other people were around. This would be his various local friends, out of town visitors like myself, his wife, etc. But when we were alone in the house or when driving in the car somewhere, Ron would sometimes just start talking about the subject. When he did this I knew it was okay to ask questions. I wasn’t necessarily guaranteed an answer as Ron was very careful about what he said on this subject, but on one occasion he told me about the entrance into the chamber where the Ark of the Covenant is located. If you have read our Ark of the Covenant Update #5 you will know something about this subject. But what most people don’t know is that Ron specifically told me, “There is no need for any further excavation to get to the Ark.” He told me that the entrance into the tunnel is open and that “it was protected”. He told me that a person could only find it if God wanted them to, otherwise they would never find it because there are so many tunnels in that part of Zedekiah’s Cave. I puzzled and prayed over what Ron meant by “protected” for several months and in February 1998 I felt bold enough to ask him about it. I thought I knew what he meant based on a statement he had made to me about the hiding of Lot’s door in the story of the angels that visited with Lot at his home in Sodom. The Bible says that the men of the town were about to break into Lot’s home when the angels struck them with blindness so that they ‘wearied themselves looking for the door’. Ron said he believed this did not mean that the men were literally struck blind but that the angels simply made it impossible for them to see the door. This would be similar to an experience that many of us have probably had when we have looked everywhere for something and then later, after we had finally given up the search, we find it in a place that we had searched several times before. The item was always there, we just didn’t see it. Lot’s door was still there but the men could not see it! About the entrance into the tunnel…. I asked Ron, “Is the entrance into the tunnel that leads to the Ark chamber protected the same way Lot’s door was protected in Sodom”? When I said this Ron gave me a very surprised look, sat silently for several seconds and then said, “Yes, that’s right”. So the reason a person could not find the entrance unless God wanted them to was because it was being supernaturally hidden from view! If the tunnel was not open this was an indication that God did not want anyone to enter. After Ron found this entrance that was protected in this manner, an incident occurred related to it. As you know, Ron worked on the Ark of the Covenant dig in cooperation with Israeli authorities. Because Ron wanted to maintain his trust with these people he made it a point to always drop into the Israeli Antiquities Authority office to let them know he was in the country. On one occasion when he did this he was told that they had a problem that they needed his help with. That problem ended up being that 6 men had entered the tunnel system through Zedekiah’s Cave in an attempt to move the Ark into a different part of the cave system. The reason for this was because the Ark’s location is in “occupied territory” and the Israeli’s were afraid that if this area was turned over to the Palestinians they would lose access to it. So to them it seemed logical to just move it. Below is the story. [Sometime in the mid-1990’s Ron Wyatt visited Jerusalem. As was his custom he went down to the office of the Israeli Antiquities Authority (IAA) to let them know he was in town and to “see if there was anything they needed his help with”. On this occasion he was told, “Yes, we do have a situation that we need your help with”. He was told to meet them at Zedekiah’s Cave that evening after dark. When Ron arrived there were a number of official vehicles parked outside. When he went in he was escorted down into the cave to the place where the entrance into the tunnel system was located that went to the Ark of the Covenant chamber. He was told that six men had been sent into the tunnel to move the Ark and the contents of the chamber into a different part of the cave system so that it would no longer be located in “occupied territory”. Shortly after the men, who were dressed in priests garments, entered the tunnel there was loud screaming heard from the tunnel. The screams were so awful that the rest of the men there were afraid to enter the tunnel. They asked Ron if he would go in and see what had happened. Ron agreed. Ron told me this story on at least two occasions. 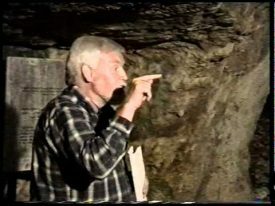 One of those times he finished the story by saying, “Bill, the thing that surprised me the most about the whole thing was that they (the 6 men) were able to find the entrance into the tunnel system in the first place”. Ron was convinced that God had allowed these men to find the entrance into the tunnel in order to give an object lesson. The point was, it is not a good idea to enter into this tunnel or disturb the contents of the Ark chamber unless you are following God’s will. Otherwise you could end up in the same condition as these six men. When Ron Wyatt had his surprise meeting with the 4 angels in the Ark chamber he was told by one of the angels that God wanted these things (the contents of the Ark chamber) revealed to the world shortly after the Mark of the Beast law was passed. Ron stated many times that he considered the passing of this law as the sign that it was now time to enter into the chamber to bring out the articles specified by the angel. As you probably realize, that hasn’t happened yet. I also want to bring out something else that has not been made public up until now. About 1 1/2 years ago, through an intermediary, we were offered the opportunity by the Israeli Antiquities Authority (IAA) to do exactly what WAR is proposing to do in July!! When I became aware of this offer I was amazed but I told my friend that there was no need for any digging to be done in Zedekiah’s Cave. I said that because of what Ron Wyatt told me years before. Since that time nothing has changed. This whole situation begs the question, What is WAR doing? What has given them the idea that God has given them permission to enter into the tunnel that leads to the Ark? They have already stated that the entrance is closed, just like it was in the past when God did not want even Ron to enter. Now we are to believe that it is proper to open that tunnel by excavation, a tunnel that God has closed??!! What are they thinking?? What has changed or what information have they received that makes them think that they have the authority to do this? The leadership of Wyatt Archaeological Research is currently holding meetings around the country saying that they are going to open this tunnel. They are encouraging people to participate in this exercise, help pay for it and to become a member of a group tour which will visit the excavation to see how things are progressing. While God has not placed me in the position to say who can and cannot work with the Discoveries, my counsel to anyone that values the work that Anchor Stone has done over the last 6 years is to stay away from what WAR has planned. Have nothing to do with it. It will not succeed unless God is in it and no indication of that has been given. For that reason I feel I must do everything possible to prevent this misrepresentation of this most special object, the Ark of the Covenant and God’s final purpose for it. Remember what Ron said, “There is no need for any further excavation to get to the Ark”. Please pray for this situation and that WAR will do the right thing.